Last week I taught a hand-on sushi class with 20 students in the studio kitchen. 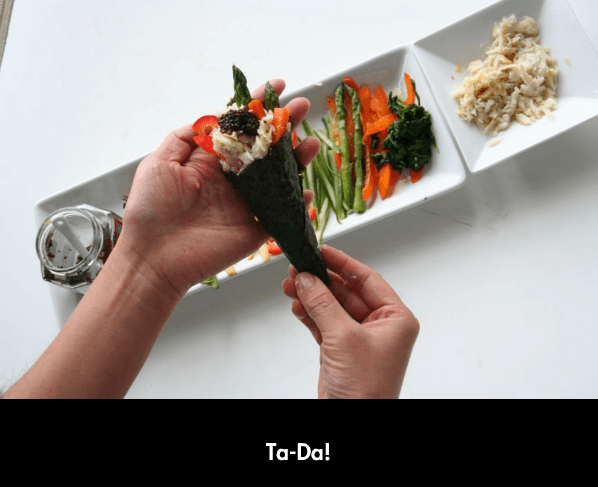 We had such a fun time making Temaki hand rolls, large inside out rolls and small Maki “cigar” rolls. Of course we had leftover ingredients, so the next evening I had a little Sushi for One party. In the photo above, I made myself a Spicy Crawfish-Mango Handroll. Do you want one? I”ll make you one too! Other ingredients above included: Unagi (sea eel), Grilled Salmon, Crawfish Tails (found a package of frozen tails at my grocer), Mango, Cucumber, Red Bell Peppers, Green & Yellow Beans and Carrots, Soy Sauce, Wasabi, Nori Sheets and Seasoned Rice. 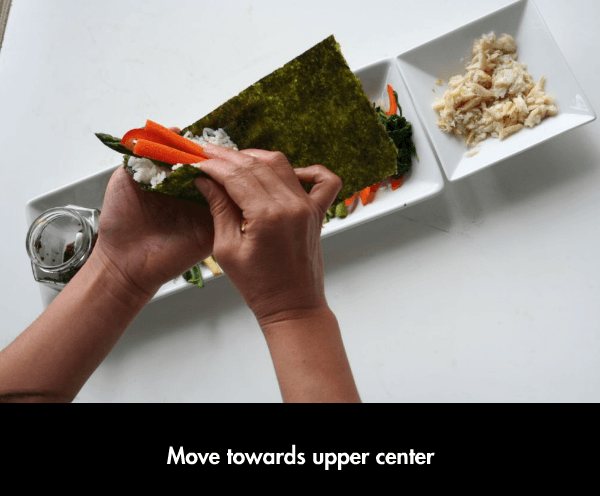 Ok, so lets talk about How to Host your Own Sushi Party at Home (Temaki Party) because its so easy and fun. 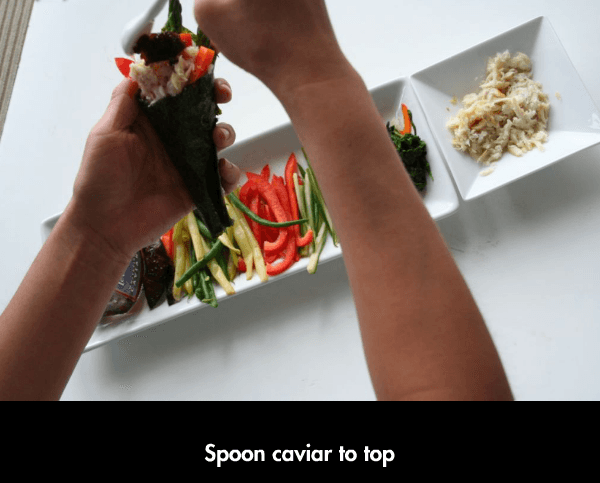 If you love sushi but hate restaurant prices – you must try this! 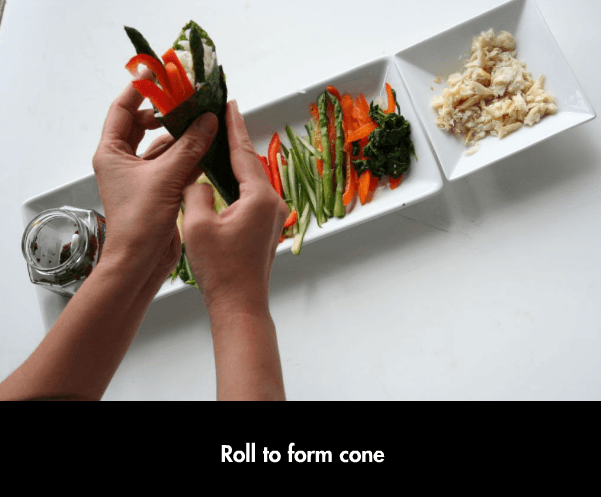 Basically, its a make-your-own-handroll party where all the ingredients are laid out on the table and each guest makes their own delicious creation. This is my favorite way to host a party when I have picky eaters. If it don’t taste good, sho’ ain’t my fault…NOBODY TOLD YOU TO MIX NUTELLA WITH CRAB. I don’t live near a Japanese supermarket, so most of the ingredients I either got at the generic Asian market or regular supermarket. So some of the ingredients I have listed below might not be the traditional Japanese stuff. Unless you are buying your sushi grade fish from a respected fishmonger or Japanese market, I wouldn’t recommend raw fish at your home sushi party. If you are lucky enough to get good sushi-grade fish, I am so envious of you. 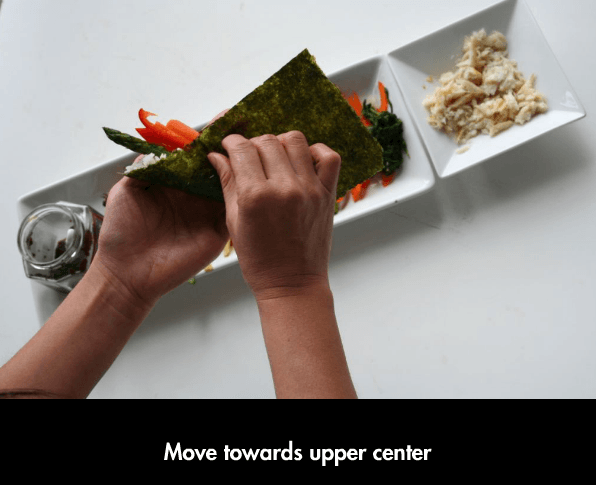 To learn how to roll a hand roll – scroll down to the bottom. There is a link to a step-by-step photo slideshow. 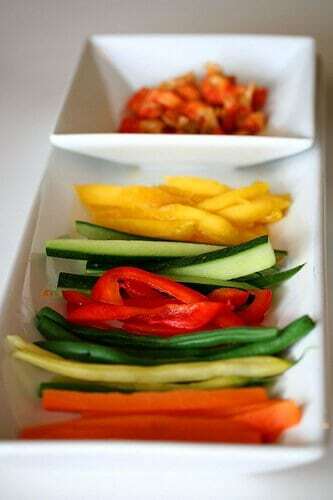 Cut Vegetables: Cut all of your vegetables up in uniform size. They should be in skinny, long 1/3″ wide 4″ long strips. Avocado should be cut at last minute or tossed with lemon juice to prevent browning. Find English or Japanese cucumbers. The regular cukes are too watery and have too many seeds. Take the cucumber, cut in half, and use a spoon to scrape out the innards – seeds and part of the flesh. You want to be left with the skin and maybe 1/4″ of the flesh. Cut in strips. Blanch Vegetables: Any hard or chewy vegetables, like carrots, green beans should to be blanched briefly first. Why? 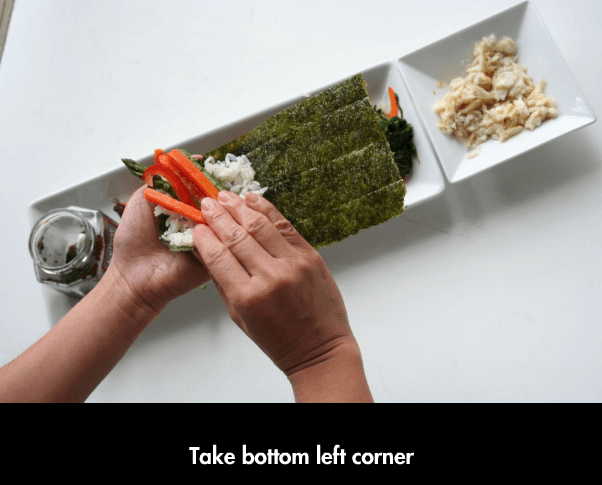 Because when you bite into a handroll, you want a nice, easy clean bite. If you had a raw carrot stuck in there, you’d bite and wrestle with the roll making a mess. Plus, it makes the carrot and green bean tasty and sweeter – blanch in instant dashi stock for even better taste. You don’t have to do this, but I like it this way. Vegetables that are crispy yet soft enough, like the red pepper can go raw. TIP- If you are making miso soup, make your dashi stock first, blanch vegetables, fish them out and then use the dashi to go ahead and make your miso. Gives extra flavor and nutrition to your miso soup. Grill Vegetables: I love portabella mushrooms. Scoop out the gills and throw them on the grill or frying pan to cook. After cooking, cut into strips. Asparagus can be steamed, blanched, grilled or roasted….just briefly though, you want the asparagus cook a bit, still crisp. If you cook too long, the asparagus turn soggy, chewy and stringy. Cut: If you have sushi grade fish, cut them into long 1/2″ – 1″ wide, 4″ long strips OR little tiny cubes. 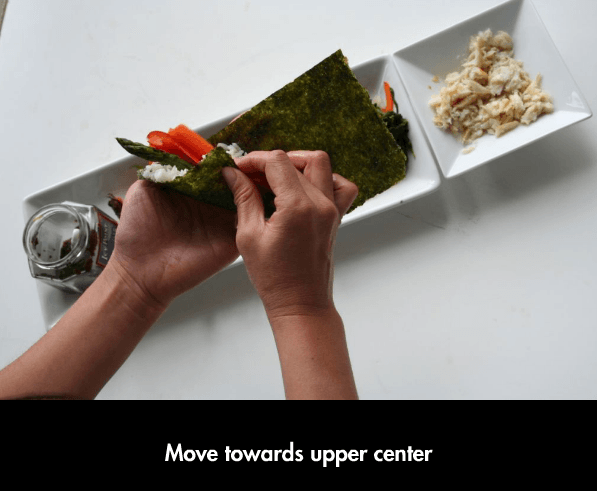 Basically, if your pieces are too wide or big, it will be very difficult to roll the sushi. Think roll-friendly shapes. 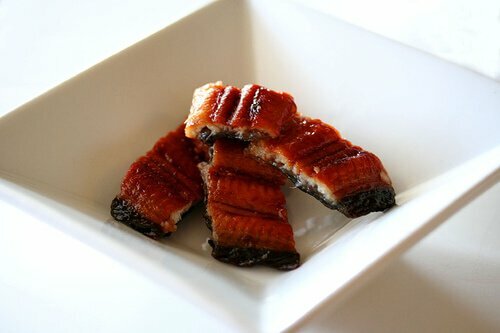 Broil: This is Unagi (grilled eel) – its sweet, savory and one of my favorite things to put in a sushi roll. Its found in the frozen section of my asian market. Unagi comes frozen in a whole fillet form, cooked already. Defrost by running cold water over package. Unwrap and broil on high, skin side up for 3-5 minutes. You really need to watch this, because it’s sweet and burns so quickly. Grill: Seafood like shrimp, soft shell crab, fish, scallops, chicken (brush with some teriyaki sauce, cut into strips). You may want to run a knife through the shrimp and lg scallops after grilling. 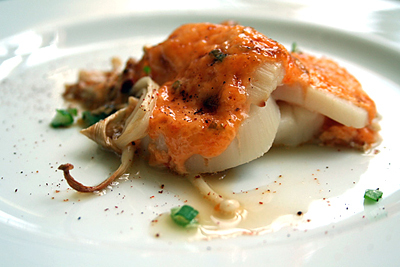 Bake: Use Rasa Malaysia’s recipe for Creamy Spicy Scallops – use small bay scallops instead. I also added chopped shrimp to the recipe. It was SO GOOOOOOODD. 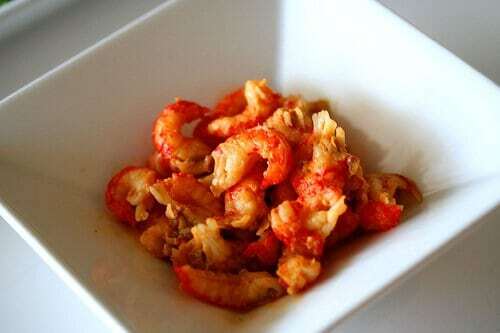 Mix: Chopped shrimp/scallops with a little mayo & Sriracha hot sauce to make a spicy concoction. Not too much mayo – you don’t want it to be wet. Or you could mix sushi grade tuna with chopped scallions, soy & wasabi. – I LOVE smoked whitefish. Just make sure you take all the bones out first. Shred with your fingers and then re-check for bones. You don’t want a guest choking over a very small, transparent, flexible bone. – Store-bought seafood spread – in my grocer’s seafood dept, they have a variety of fresh made spreads, one of them includes chopped salad shrimps + imitation crab. – Kayln’s Mango Salsawith Red Bell Pepper The salsa would make a killer handroll with grilled salmon! – Teczcape’s Chicken Katsu without the curry sauce. Just fry the chicken katsu and cut into strips. – I was able to get Masago (orange roe) frozen at the Asian grocer. 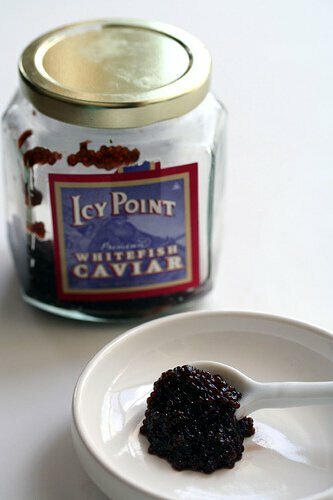 But I also had caviar from the supermarket too. Oh, I have to share – at BJ’s, my local warehouse, I found a jar of Whitefish Caviar for less than $10!!!! It was not the gucci gucci good stuff, but it was not bad. In the sushi roll, it was really good!!! 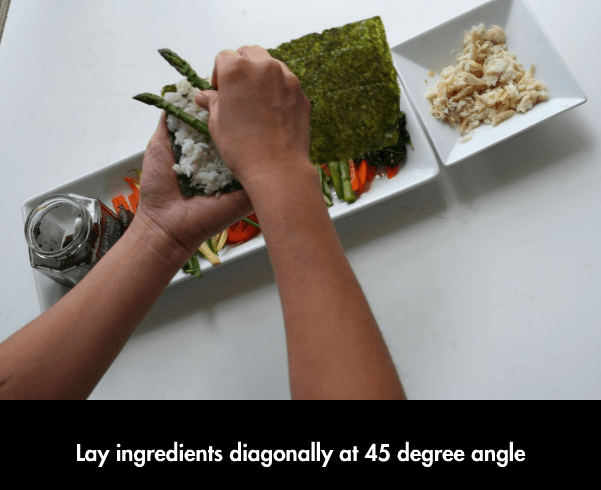 You wouldn’t want to waste the expensive stuff inside a sushi roll anyways. I just wanted the briney pop-in-your-mouth feeling. How cool is it to pretend like a pooh -pooh rich person scooping a big giant spoonful straight into your mouth?! – Also found frozen crawfish tails at the market (Publix $9.99 for 1 lb). Mix with some Japanese mayo, masago and Sriracha. 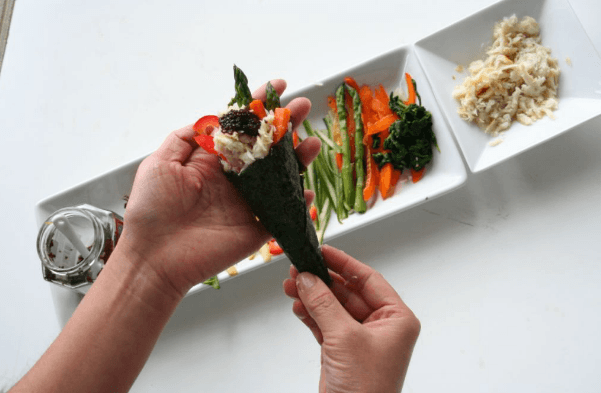 – How to make sushi rice from Beyond Salmon. 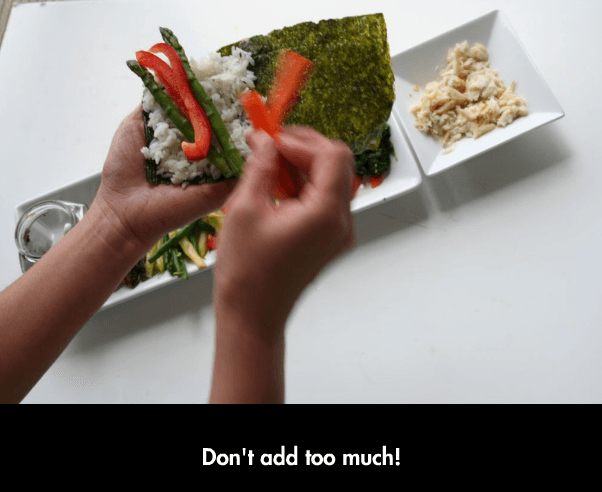 General rule for a Sushi Party – 1 cup of raw rice per person is plenty. You never want to run out of rice in the middle of a sushi party! You can make separate batches of rice, just keep your cooked sushi rice covered with damp towel. You don’t want to serve hot rice – which would make the seaweed soggy, room temp is fine. 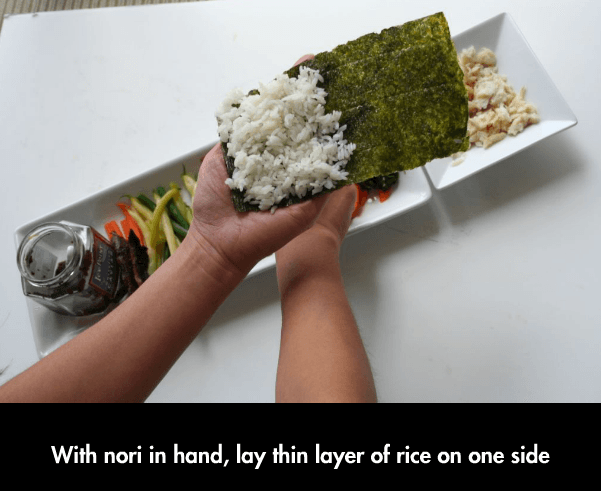 1 cup raw rice makes about 2 cups cooked rice, enough for about 4-5 hand rolls per person. 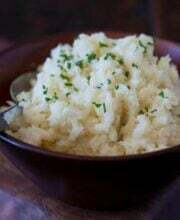 (If you have hungry guests, make an extra batch of rice just in case) *Note – if you are using a rice cooker, estimate 1.5 rice cooker cups of raw rice per person. The cups that come with rice cookers are much smaller. – Spam! Fried Spam slices. I know. I promise this will be the last post this month that mentions Spam. But just to prove that I’m not the only crazy one – Wandering Chopsticks also ate Spam Sushi. 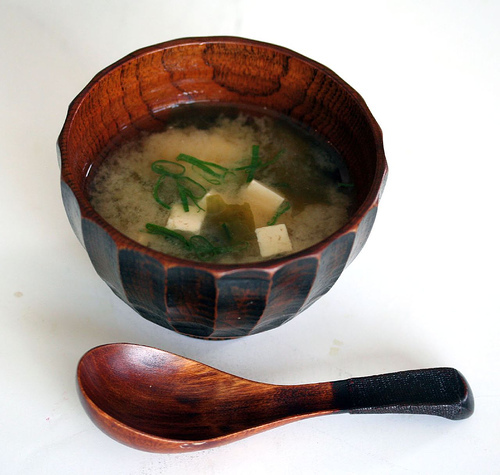 – Make Miso Soup – its super easy and only takes 10 minutes max. 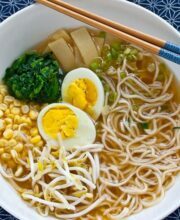 – Serve some Edemame, boiled soybeans. Boil them in dashi stock instead of salted water. Much better tasting! Just got into making my own sushi. Thinking about crawfish. Question, your article did not say anything about cooking the crawfish, is it cooked? Hi Joe – yes the crawfish is cooked 🙂 Unless crawfish is sold live, it’s always cooked prior to sale. Very awesome idea! A must do! By the way, ‘spam sushi’ – called spam musubi – is a local FAVORITE here in Hawaii! So many variations of musubi (chicken katsu musubi, spam furikake musubi, etc..), .look into it if you havent already! I’d love to see your variations! 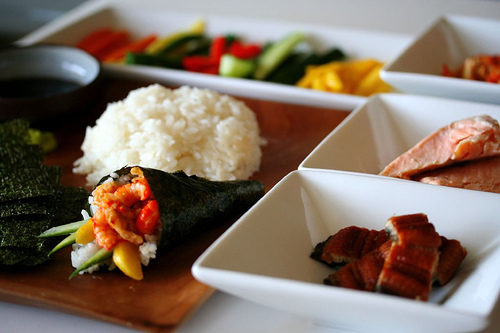 The sushi looks so yummy… I am actually getting hungry already and I thing I am craving for a plate of sushi. Well the good thing about knowing how to cook is that you don’t have to run to restaurants just to taste your favorite foods and you can have it anytime you want. Neat! What size do you use for the regular handrolls? Half of one regular piece of nori it looks like? Pingback: Sushi Party « gaselile mele pe care voua nu vi le arat! Mrs. HBT- You are such a sweet gal leaving me nice comments! Do you have a Walmart near you? well, that is a dumb question, because I think Walmart has taken over the world! Anyways, I was just there today and they have some brand new merchandise – very cute white bowls for $4, platters for $5, wooden blowls for $3. The Walmart I went to was a Super Walmart and they had such a great selection. Many years ago, my colleague told me that his girlfriend buys shoes first and then buys clothes to match her shoe. Ever since I started to read your blog, I find myself shopping for dishes. When I see a beautiful platter or bowl, I would think what kind of food I can cook to match it. This is my second time reading this article and reading it second time is as good as reading it the first time. I will probably come back and read it again in the near future. I would love to host a sushi party. Colorful little art that are pleasant to the eyes. First, I need to buy appropriate and versatile dishes to serve my sushis in. Your white square platters is just the ones I am looking for. Your blog has inspired me to make some additions to my own. It’s scary the same number of items I want on your want list. The sushi for one looked great. I’ve been thinking of a bento themed dinner. Any suggestions? Know of any good places I can get cool bento boxes? Cindy- Yeah, like a burrito! It does take a little practice. Chef Wing- I love the creations that you make – beautiful work. You have a very appealing site, jaden. Thanks for dropping by my site. I would say, a collaboration like this would boost the gastronomic world even more. the spicy crawfish-mango handroll sounds oh, so good! 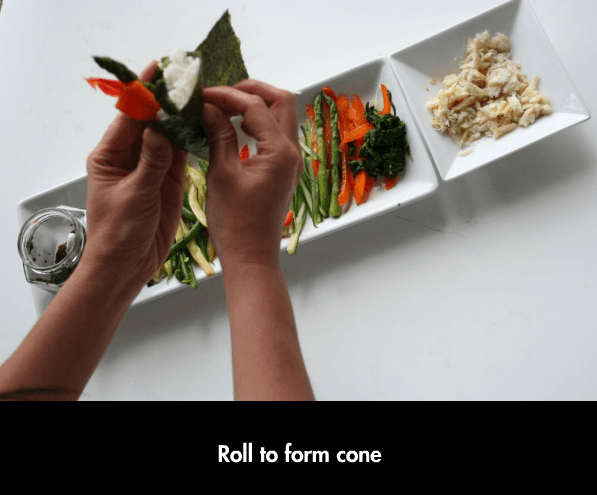 the tutorial on rolling a handroll makes me think it is like rolling a burrito…takes practice! the thought of a sushi party sounds fun, but unfortunately, my daughter and i are the only one in our little circle that enjoy sushi! but it is something that we do together, both at home and at sushi places. Oops, I meant that you have the talent of Julia Child, but the looks of an Asian Angelina Jolie! Rowena- good thing handrolls don’t req’ chopsticks! I just eat with my hands! Blondee- I’ve never done that before…but it does make sense that the freezing would kill the bugs. Eliza- good thing iits healthy for you! Someone once told me if u are not sure fish is fresh for sushi, if u freeze it and then defrost all the bacteria is gone, and I have done this for tuna tartare. I had one guest though who works abroad in China quite often, and he, being the only italian that could competently use HIS chopstix, REFUSED to give them up for the rest of the evening — even when the cuisine switched from sushi to spaghetti! Arghghgh! Amy- me too – Unagi-don is so good. But you know what? restaurants charge $10 for a bowl of rice and a 1/4 fillet of unagi. Real cost of an entire fillet of frozen, cooked eel is $3. Which means cost of your bowl was about $.75 That is such a rip off! Kalyn & Brilynn- I’m available for private instruction. Just send me your lear jet. Ellie- All my vegetables are organic from the farm stand….it looks and tastes so much better than regular supermarket stuff. Tigerfish- oops! I’ll have to corrrect! WC- oooooohhhh that sounds SO good. Include fish cake, the meat inside a bahn mi, pickled carrots. I’m so going to do this! PE- Thank you! (blush) I’d rather be the Chinese Giada! I love Julia and all, but she’ wasn’t all that hot! haha! Lydia- My kids actually wanted to squirt some Hershey’s syrup. yeeewwwww. As end of school thing, I might teach my 3 1/2 yr old’s class how to make sushi. What a great post! 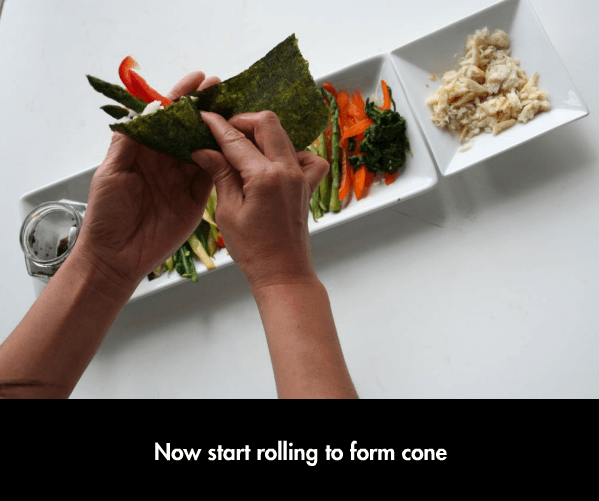 I love having people make their own maki rolls — I usually stick with vegetarian versions, but one of my cooking groups with kids even tried peanut butter and jelly rolls! (yes, it was messy….) I love to throw in fresh herbs from my garden, too. I learn so much from you every time I visit your site! I had no idea that you were supposed to blanch the vegetables first. You need to be on television! I would pay money to learn from you! Do you deliver? Because that looks amazing! This is one of our favourite meals in summer when the produce is fresh and at it’s best, but I have to admit that our preparations never look as good as this! 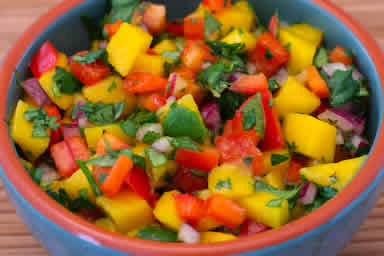 Jaden, what a great post, and thanks for including my mango salsa recipe. 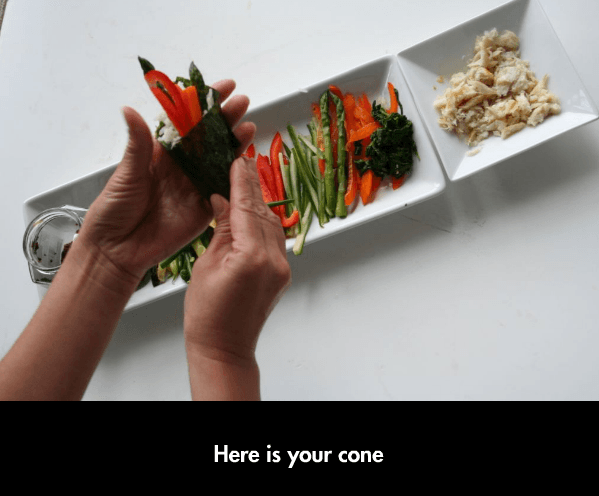 I love sushi and if I lived close to you, I’d love to come and take your sushi class! Sushi party sounds like a great idea! I’ll have to do that in the future. And OMG I love unagi, just give me some unagi and rice and I’ll be super happy. RM- Go online and look for just the shells. Restaurants use/reuse those all the time. I used scallop/shrimp leftovers in an omelette next morning – it was so good! I am glad you liked my scallop recipe. Yeah, they are great. I would love to try baking the scallops with the half shell, but I can’t find any fresh scallops with their shells here. Bummer.